A great king once asked all of his best scholars to compile a history of the human race. After many years of work, the scholars came to him with the results of their work– 500 thick volumes, carried by a caravan of mules. It was the most comprehensive history ever written. This certainly is what we see of it, and a sad story it is. Billions of individual persons, each one, a miracle of life; but here only for a moment and then gone forever. Yet strangely, many people are indifferent to such a hopeless prospect, giving it little or no thought. But, one might say, “Facts are facts, and if that is all there is to it, there is no reason to add to the misery by dwelling upon it; so let’s just eat, drink, and be merry, for tomorrow we may die.” Why ruin the little bit of time we have by thinking about how sad and pointless it all is? Unless, that is, there is more to the story. And if there is more to the story, one would think all would be eager to hear about it. In fact, if there was even a possibility of more, it would only be reasonable that everyone would be on the alert for any sign of hope, paying close attention, yearning for any bit of good news that would suggest a different ending to our story. The Bible does tell a bigger story, revealing to us that there is more to life than being born, suffering, and dying. Knowing what God tells us in that book about our lives changes everything, now and forever. C. S. Lewis once compared the history of the world to a great play, many acts long. He said that each one of us makes our short appearance as a character in just one small part, in just one scene, of one of the many acts of this grand play. This is our only appearance, and that is all we see of the play. We may hear about some of what happened in the earlier acts, but we play our part not knowing anything of the rest of the play. We don’t even know if our part is in the beginning, middle, or near the end of the play, nor do we (on our own) know anything of how the play turns out. We live our lives and we play our parts, but we don’t know nearly enough from the little bit we see and hear about to evaluate the play. Many things will not make any sense to us– but that is what one would expect if seeing only small part of a long play. We don’t even know if it is a comedy or a tragedy or a farce. This illustrates our plight. But we are not in a play, we are living a real life, and it would be most interesting, and perhaps even of crucial importance, to know how the play turns out. The Bible reveals to us much more of the play. Most importantly, it tells us how the play turns out, and how we can best play our part. The Bible itself is primarily a story. Its pages are filled with stories, all of which are a part of, and point to, the main story. This is how Abraham Heschel describes the main story: “All of human history as seen by the Bible is the history of God in search of man;” every man and every woman. And so we find the rest of our story in the Bible. We find out how we got here, and what our part is in the play, and how the play will end, and even whether or not we will make another appearance. And we also find out that how we play our part now makes all the difference. Ecclesiastes 3:11b — …No one can fathom what God has done from beginning to end. Lord Jesus Christ, we are seekers after a city not made with hands, eternal in the heavens, in that better Country of Life which is the home of the soul. Be Thou our Guide, through the darkness in the Valley of Shadows, to the beautiful shore in that land of peace and rest. Here we live so small a part of our life; here we are strangers and pilgrims. Be Thou our Savior and help us so that we lose not the way to the Father’s house. Prepare a room in our hearts that we may one day inherit a room in that place where God himself shall wipe away all tears and where shall be no more death, neither sorrow, nor crying, nor pain; forever and ever. Amen. When I was a child I watched a lot of cowboys and Indians movies, and it was the same thing every time. The cowboys were always the good guys and the Indians were always the bad guys. Simple. Then there was a change of mood in Hollywood, and for a while the good guys were always the Indians and the bad guys were always the cowboys (or the soldiers or whoever was against the Indians). Again, simple. But in both types of movies it was too simple. Reality is seldom like that, and the best movies show more of life’s complexities. There might still be those characters who are mostly good or mostly bad, but in those better movies we are shown the motivations, confusions, and failings, along with the goodness and humanity of those on both side of a conflict. Sometimes the Bible is read with a simplistic good guy-bad guy approach. In the Gospels, for example, Jesus and his disciples are the good guys, and the Romans and the Pharisees are the bad guys. Simple. But a closer reading of the Bible shows it to be more complex than that. The Pharisees are often opposed to Jesus, so a casual reader could get the impression that they are his enemies, and therefore, the bad guys. However, the Pharisees usually call Jesus ‘Rabbi’ which is a sign of respect and honor. They engage him in conversation, sometimes to trap him, but usually just to learn from him. And there were times when a Pharisee even invited Jesus into his home for a meal. Pharisees were serious about their faith, and they wanted to understand this brilliant and popular new teacher. The Pharisees were the most meticulous of all Jews about obeying the Law. This oftentimes made them unbearably self-righteous. If you made even the smallest mistake, they were the first to judge you and look down on you. But they were determined to obey God, and were therefore honest and upright and loyal and generous. They were good citizens and neighbors. You could trust them. They paid their bills. If they borrowed your lawn mower, they’d return it, in good working order and full of gas. That’s the kind of people they were. They were perfectionists, with all the blessings and annoyances that come with being perfect. They’d be the type who would drive you crazy if you had to work with them on anything, but you could trust them to get a job done and done right. The third chapter of John tells the story of when a Pharisee named Nicodemus came to talk to Jesus. Nicodemus was also a member of the Jewish ruling council, Jesus’ worst enemies. It was this ruling council that condemned Jesus to death. But this was early in Jesus’ ministry, and Nicodemus wanted to get to know him better. So he came to Jesus for a personal conversation, apart from the crowd. But he did come at night, indicating that the tension was building and it was no longer prudent for a Pharisee to be seen having a friendly chat with Jesus. His words were a simple observation about what he had observed about Jesus. But Jesus responded with a rather difficult statement: “Unless a man is born again, he cannot see the kingdom of God.” Nicodemus clearly did not understand what Jesus meant, and the conversation seemed to go downhill for a while. One would think Jesus would be happy with a friendly visit from one of the opposition, but Jesus made it difficult for Nicodemus. I don’t know why Jesus responded with such confusing language. I am sure he had a good reason. I do know from talking to people who might be trying to understand who Jesus is, that the search for religious truth can be difficult and confusing. You will probably not comprehend it all in just one sitting. (…continued) This scene from Amistad illustrates several important Biblical truths. Though that scene is fictional, the historical truth is that kind of thing happened all over the South to a majority of the slaves. The two captured Africans in the movie saw in the Bible pictures a story that brought hope, even in the face of injustice, oppression, and possible death; and a high percentage of the real African-American slaves saw in the Gospel a story that gave them hope in the face of their oppression and hopeless lives. When given the opportunity, the slaves in this country turned to Jesus Christ by the millions. To this day, the church remains a powerful presence and force in the Black community. In that fictional scene, the movie accurately portrayed a powerful movement in American history. The slaves heard, believed, and took comfort in the message of Jesus Christ, and the hope of a better life beyond this one. They sensed a truth and a power in the Gospel that transcended the ways individual believers, such as their owners, had perverted that truth; and the slaves believed it and took hold of it. The two Africans saw very early in the Bible story pictures that something went wrong. They could see the effects of that, but the pictures could not tell them what it was that caused the trouble. But by reading the whole story, we learn that the problem was that the people God created and loved began to turn away and disobey and ignore God. The pages of the Old Testament are filled with expressions of God’s anger, frustration, sadness, disappointment, and bewilderment at such a response from those he created and to whom he gave everything. It was when they turn away that the trouble and the sadness begins for them, and that is what the slaves saw in the pictures. The focus of the story that the slaves see pictured in the Bible is Jesus Christ. Seeing who Jesus was and what he did gave them hope. Earlier in the movie, an old and experienced lawyer gives some good advice to the team that is defending the slaves and arguing for their return to their homes in Africa. The old lawyer says, “When you are in court, remember that the one who tells the best story will win.” In the movie that had to do with the telling of the slaves tragic story– being taken from their homes, mistreated, and brought here to be bought and sold like animals. Tell that story in a way that makes them look like humans and not animals, said the old lawyer, and you will move people’s hearts and you will win. For me, that line hinted at a deeper meaning, one found in another story. It is almost immediately following that old lawyer’s remark that the scene shifts to the prison and the two slaves looking at the pictures in the Bible. That truly is the best story that has ever been told, and it has been winning the hearts and minds of people all over the world for the last two thousand years. “The one who tells the best story wins,” said the old lawyer. The Gospel of salvation in Jesus Christ is God’s own story, and the only story that goes on into all eternity, and therefore is indeed the very best story of all. The most important thing in life is to hear and believe and remember that story. Hosea 14:1 — Return, Israel, to the Lord your God. Your sins have been your downfall. Jeremiah 13:24-25 — “I will scatter you like chaff driven by the desert wind. This is your lot, the portion I have decreed for you,” declares the Lord, “because you have forgotten me and trusted in false gods. Father in heaven, you have first loved us, help us never to forget that love. May the sure conviction that love triumph in our hearts over the seduction of the world, over the restlessness of our spirit, over our anxiety for the future, over our guilt about our past, and over the distress of the present moment. Grant also that this conviction may discipline our soul, so that our hearts may remain faithful in the sincere remembrance of your love for us, and your command that we love others as ourselves. Amen. 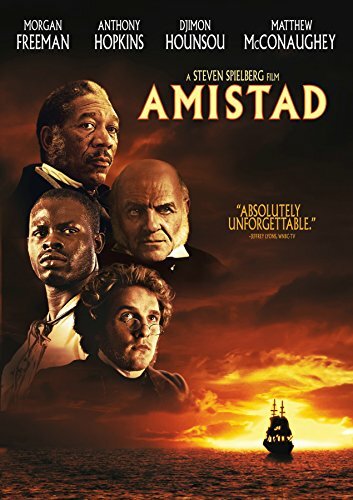 The 1997 movie Amistad presents the most powerful portrayal of the Christian message I have ever seen in a movie. The movie is based on an event that happened in Connecticut in the mid-1800’s. The Amistad was a ship that transported captured Africans to be sold as slaves in the American South. The human ‘cargo’ on the Amistad managed to overthrow the crew and take over the ship. They left two of the Spanish crew-members alive in order to turn the ship around and take them back to Africa. But the two Spaniards tricked the Africans and brought them to America. Unfortunately for the crew, they landed in a northern city where slavery was not allowed, and, where a large part of the population was very much against slavery. The result was a complicated court battle to determine what to do with the Africans. To whom did they ‘belong,’ or, should they be taken back to Africa? The trial eventually involved the President of the United States (Martin Van Buren), a former President (John Quincy Adams) who helped argued the case on the Africans’ behalf, the Supreme Court of the United States, and the Queen of Spain. The part of the film I want to describe is a scene that takes place inside a prison where the Africans are being held while the trial takes place. The African with the Bible responded, “I know I can’t read, but there are pictures, and I think I am beginning to understand it.” He then brought the Bible to the other man, sat down with him, and began to show him the pictures. He tells his friend the story and explains what he thinks it means. The movie brilliantly portrays this illiterate man coming to some understanding of the Gospel, and how the story he sees in the Bible pictures speaks to them in their own predicament. Along with that, his narrative becomes a wonderful summary of the old, old story as heard and understood by someone for the first time. “Look,” he says, pointing to a picture of the garden of Eden, “the story starts out very nice, in a beautiful place where everyone is happy.” The men remember their own beautiful home from which they had been taken, the place where their story had begun. Then he turns the page to another picture, a picture of fighting and killing, perhaps an illustration of some Old Testament war. “Then something goes wrong,” he says, “and they all start fighting. There is much suffering and everyone is sad.” By now the second African is paying close attention. Something has gone very wrong for them, too. “But then something happens. A baby is born,” the first man explains, pointing to a drawing of the scene in the stable the night of Jesus birth. “Who is that?” asks the intrigued listener. “I don’t know, but he must be important, because the sun follows him wherever he goes,” says the first man, pointing to the halo of light that is always around Jesus’ head in old books and paintings. But then they come to another disturbing picture. The first man says, “But then some bad people come and put this man in chains and make him bleed and are very mean to him.” He points to a picture of Jesus being pushed and mocked by the soldiers. They then look at a picture of Jesus nailed to the cross, and they wonder if that is what the white people are planning to do to them. Acts 11:4 — Starting from the beginning, Peter told them the whole story. Psalm 107:1-3 — Give thanks to the Lord, for he is good; his love endures forever. Let the redeemed of the Lord tell their story— those he redeemed from the hand of the foe, those he gathered from the lands, from east and west, from north and south. Bust of Squanto from Pilgrim Hall Museum, Plymouth, MA. Most of us know the story of the first Thanksgiving; at least we know the Pilgrim version. But how many of us know the Indian viewpoint? No, I’m not talking about some revisionist, politically correct version of history. I’m talking about the amazing story of the way God used an Indian named Squanto (1585-1622) as a special instrument of His providence. Historical accounts of Squanto’s life vary, but historians believe that around 1608, more than a decade before the Pilgrims arrived, a group of English traders sailed to what is today Plymouth, Massachusetts. When the trusting Wampanoag Indians came out to trade, the traders took them prisoner, transported them to Spain, and sold them into slavery. It was an unimaginable horror. But God had an amazing plan for one of the captured Indians, a boy named Squanto. Squanto was bought by a well-meaning Spanish monk, who treated him well and taught him the Christian faith. Squanto eventually made his way to England and worked in the stables of a man named John Slaney. Slaney sympathized with Squanto’s desire to return home, and he promised to put the Indian on the first vessel bound for America. It wasn’t until 1619, ten years after Squanto was first kidnapped, that a ship was found. Finally, after a decade of exile and heartbreak, Squanto was on his way home. But when he arrived in Massachusetts, more heartbreak awaited him. An epidemic had wiped out Squanto’s entire village. We can only imagine what must have gone through Squanto’s mind. Why had God allowed him to return home, against all odds, only to find his loved ones dead? A year later, the answer came. A shipload of English families arrived and settled on the very land once occupied by Squanto’s people. Squanto went to meet them, greeting the startled Pilgrims in English. Who but God could so miraculously convert a lonely Indian and then use him to save a struggling band of Englishmen? It is reminiscent of the biblical story of Joseph, who was also sold into slavery, and whom God likewise used as a special instrument for good. Genesis 50:15-21 — When Joseph’s brothers saw that their father was dead, they said, “What if Joseph holds a grudge against us and pays us back for all the wrongs we did to him?” So they sent word to Joseph, saying, “Your father left these instructions before he died: ‘This is what you are to say to Joseph: I ask you to forgive your brothers the sins and the wrongs they committed in treating you so badly.’ Now please forgive the sins of the servants of the God of your father.” When their message came to him, Joseph wept. O Lord our God and heavenly Father, which of Thy unspeakable mercy towards us, hast provided meate and drinke for the nourishment of our weake bodies. Grant us peace to use them reverently, as from Thy hands, with thankful hearts: let Thy blessing rest upon these Thy good creatures, to our comfort and sustentation: and grant we humbly beseech Thee, good Lord, that as we doe hunger and thirst for this food of our bodies, so our soules may earnestly long after the food of eternal life, through Jesus Christ, our Lord and Saviour, Amen.